Smashers io is an uber fun new game. Players have to smash opponents using their hammer to keep advancing and growing. The more opponents you smash, the more your score will increase and so will your chances to be on top of the leaderboard. This game is super exciting and interesting to play; the players can play it for hours and will never seem to get enough of it. Enter the arena by typing in the name of your choice on the menu board. You can change the skin of your player from the same screen before starting the game. More skins will unlock as you excel in the game. 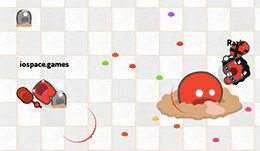 During gameplay, worms will keep popping and disappearing along with other players. You have to smash as much opponents as you can in the least amount of time to put up a good score. The timer is on the scoreboard on the top left of the screen. Look for bigger enemies to destroy in order to gain more points, but be careful since it can be tricky and you might end up getting smashed yourself. All you need is your mouse or touchpad to play. To move your player across the arena, simply point and drag your mouse in the direction you want it to go. Click on the left mouse button to smash enemies with the hammer. By clicking on the right mouse button you can activate ‘sprint’ mode, this allows your player to move faster. Furthermore, there is a hammer icon on the bottom right of your gameplay screen; this activates a larger hammer to help you beat enemies effectively.